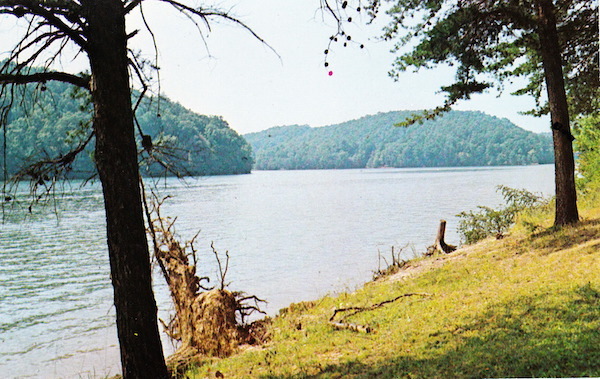 The theme for this group project called for altering a vintage postcard featuring Lake Philpot. Above is the finished postcard and below is the backside with the story. 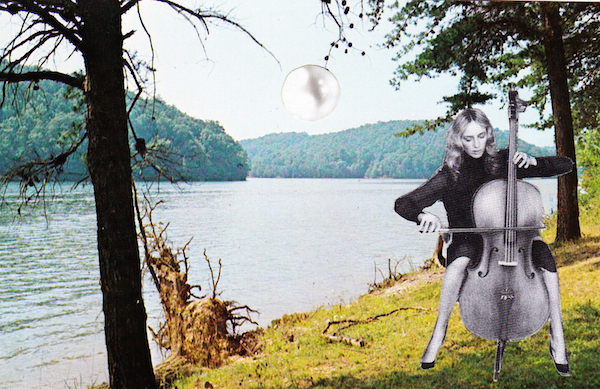 On nights when the moon rose in the sky like a pearl, she came to the lake to play her music. Sometimes, if she were lucky, Philpott would appear wearing his bundle of twigs for a tail . 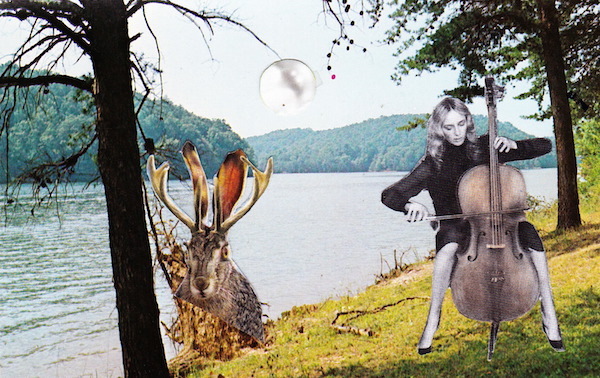 She’d heard the story as a child of how animals get their ears and such. At fairy stone, one nameless animal was offered a pot to fill with a set of ears or horns and one tail. As he couldn’t decide, he filled his pot with cat ears, bunny ears and the horns of a deer. And in his indecision and enthusiasm, he forgot to include a tail. So that is how Philpott got his name and twigs for a tail. 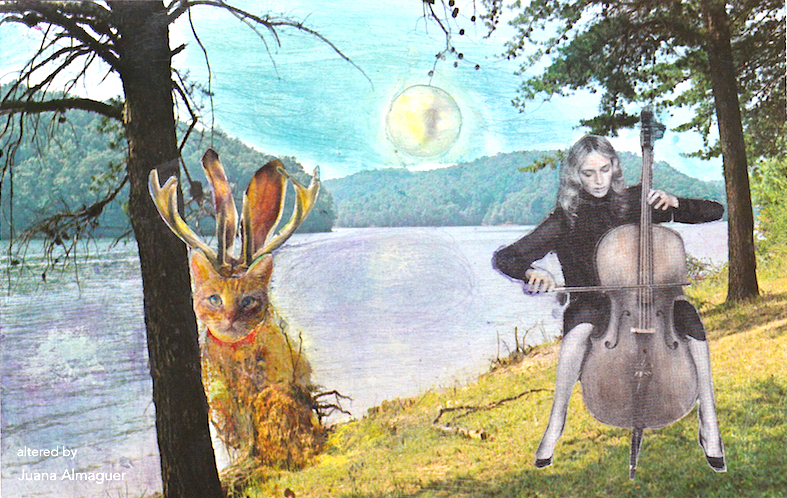 After debating whether to paint or collage images onto the postcard, I settled on the latter. So I headed to my local thrift store to scour the magazine section for candidates and came home with several magazines. I cut out images of animals and people in all sizes. As I added each element, a story began to develop in my head, and each helped in turn to build the relationship between image and words. 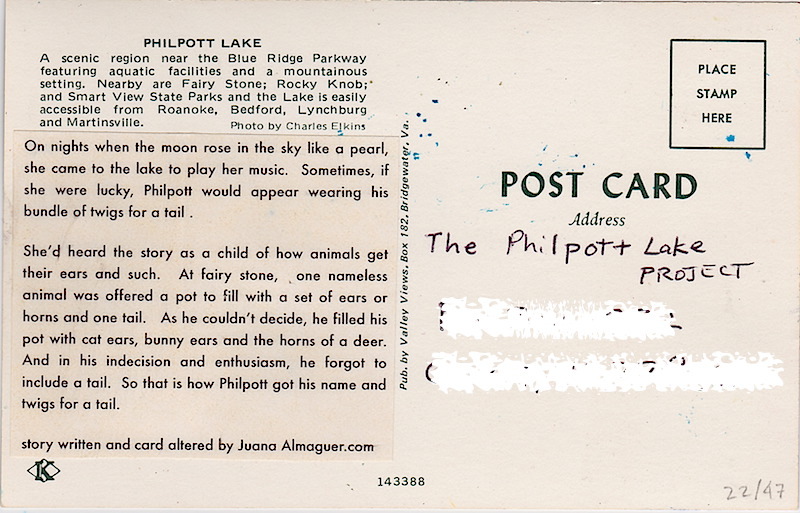 The place names listed on the back of the card (fairy stone and philpot) also provided inspiration for my story. To lighten the background colors of the grass, water, hills and sky, I sandpapered the postcard and then added washes of watercolor, inks and watercolor pencil. I really enjoyed working on this project and creating a story to compliment the imagery. Now to pop it in the mail on Monday! What a great story and intriguing image! That's a very imaginative and fun story to read, and you illustrated it beautifully as well.